Blogger is one the most powerful term of the internet and its getting even better as time passes the reason why its users is increase on daily basis as most of the WordPress users are finding ways to transform there WordPress Blog to Blogger by exporting and import there blog posts.Which is not a difficult task in few steps we can easily convert WordPress To Blogger.Blogger provides much easier interface,easy optimize templates,widgets and much more.WordPress also have some good features but in my opinion Blogger is simply the best.Old Rivals WordPress Vs Blogger who is the Best.So I my self recommend you to use Blogger as it has great importance in the town of internet. So Today we will learn How To Transform WordPress To Blogger Blog before we get started lets look at some disadvantages of transforming your WordPress blog to Blogger. 1.If you owns a WordPress blog which has thousands of post then you should not transform it to blogger.If you transfer it to Blogger all the indexed content will become useless. 2.There is no redirect system in Blogger if you are thinking of redirecting your old WordPress URLS then you are making a biggest blunder don't even think of it Blogger doesn't supports redirects. 3.You will loss all your search engine audience.If you change Wordpress To Blogger then you have to start working from beginning.Note:You can easily transport your WordPress posts. 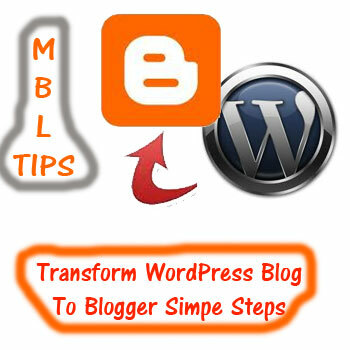 Remember:Only to Transform Your WordPress Blog To Blogger If Your Blog is New. 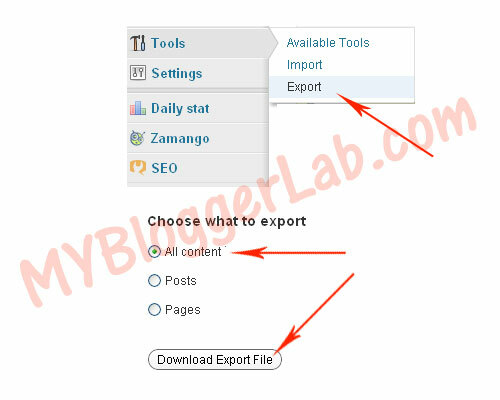 Your first task is to export your WordPress posts.To export WordPress blog posts go to thewww.yourblog.com/wp-admin >> login to your account with username and password >>Select Tools >> Export >> Download Export File. That's how your blog posts will be exported in WordPress WXR export file so thats clear you cannot upload this file to Blogger as it only excepts XML format now we have to convert WXR to XML file. Now to convert WXR to XML we will take help of the website which is own by Google allowing users to easily convert their WordPress To Bloggerhttp://wordpress2blogger.appspot.com/ .Simply upload the file which we download previously "WXR" format and click on convert.Remember:This hosted application will only allow downloads smaller than 1MB. 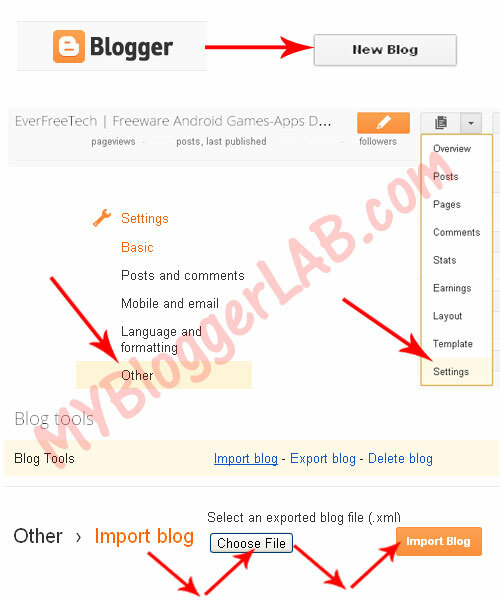 Now Simply Go To Blogger.com >> create a new blog >>After you set-up the blog >>Settings >> Other >> Import Blog >> Choose the XML file >> Upload and now your work is done. Now your all work is done Important: if you uploaded your all data on .blogspot.com domain and you want to transform it to your WordPress domain See this Transforming Blogger Blogspot To .Com Domain Name With cPanel after applying this your self hosted WordPress Blog would be converted to Blogger Hosted by Google inc.Blessing and peace buddies. Yes You can Covert Your Blog To WordPress But For it You Need a Hosting With a Domain And Then Simply Transfer Data To WordPress Blog And Simple. I really appreciate this, But I want some other answer too.. But I use a blogger and I bought a nice wordpress theme, So can I use it to blogger. IF yes how. Please help me. I don't want to use wordpress and I have lots of blogger posts too..
No you can't until you hire a developer to convert the WP theme to Blogger for you. Hi, thanks for that but my file is bigger than 1MB (6MB) ! Do you have a solution ? http://wordpress2blogger.appspot.com/ is down. Still at a few days. do you have any other converting options?